Flying with little ones can be fun or it can be a nightmare! It’s a good idea to err on the side of fun whenever you can with a little planning!! Flying is fun and amazing! It truly is a “wonder”. Point out the window and talk about how tiny everything looks. Talk about the similarities and differences between planes and birds. Have them count how many people fit on a plane versus in your van or sedan. Have them pretend they’re the pilot! Every parent will have their tried-and-trusted, simple yet effective game that keeps everyone occupied. Pull out the classics like ” I Spy” or grab a paper and pen for a few rounds of “Tic Tac Toe”. 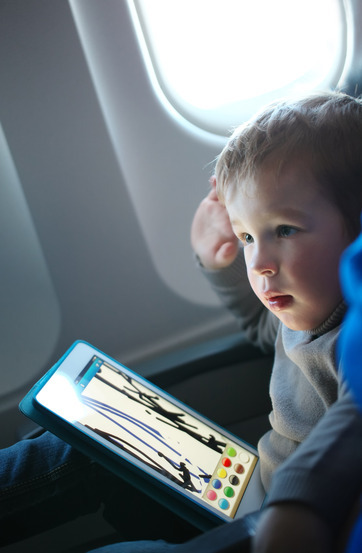 If at all possible, choose flights at a ‘normal’ time, meaning a time when your kids are more likely to fall asleep. Although this could backfire as they’ll be so excited that they won’t want to sleep and will get all tired and cranky, which will be a great start to the vacation. This may seem a little left-field, but it so makes sense. Sometimes breaking the flight up via connecting flights rather than a non-stop flight is a good idea because it gives your littles a chance to run and jump in the airport. Make sure the littles use the potty pre take-off. Of course, as with most advice concerning children, this is easier said than done. “I don’t need” quickly turns to “I need’. Remember not to give them too much to drink as this will help with numerous trips to the on flight bathroom as well. Bring an iPad (or similar device) to keep them entertained so they can play games like Temple Run 2, Go Cart and of course, Angry Birds. They won’t become gadget addicted….It is just a flight so let kids do what is interesting for them even if at home you limit the time they spend on a computer or playing games. As parents know only too well, ideals go out of the window in the face of a child in the midst of a melt down. Hungry kids are cranky kids. Bring some fruit snacks and fishy crackers. Bring a pillow and a small blanky. Something else that’s uncomfortable? Ears that don’t pop as they should during take-off and landing. If your child can have gum, give them some to chew. Otherwise offer a gummy candy because a moving jaw makes for comfy ears during a flight. If you have assigned seats on the plane, wait until the end to board—or have one parent board with carry-on luggage while the other stays in the boarding area with the kids. Although pre-boarding privileges can be tempting, be wary of tacking an extra 30 minutes of sitting onto an already long flight. There’s nothing worse than a child who is already sick of the airplane before the wheels have even left the ground. Very good advice! We also sometimes choose flights with stops. It makes the whole travel day longer but gives our kids a chance to get off the plane and move for a bit. What if my vest was being worn during a crash?